Much like many other places in our country where the coastline is shallow, fishermen carefully lower a long floating net in a circular arc across the bay. A team of villagers would then slowly heave both ends of the long net until it is completely pulled ashore. This is called Taksay here in Antique, aptly named after the net that is used. 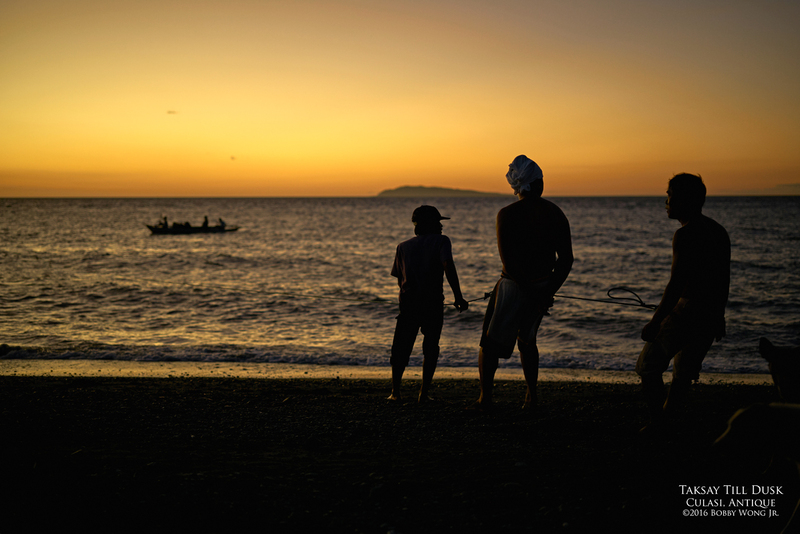 In Culasi in Antique, up to 10 teams work the shore every day. On good days, they'll fill up to 7 pails of small fish. This evening, most teams collected only five each. Not too shabby for a few hours work. Life is simple here. And they will be back at it tomorrow. Enjoy. Pixel-peepers: When it isn't bright enough to take a photograph, try switching vantage points and shoot directly into the light, rendering your subjects as silhouettes.